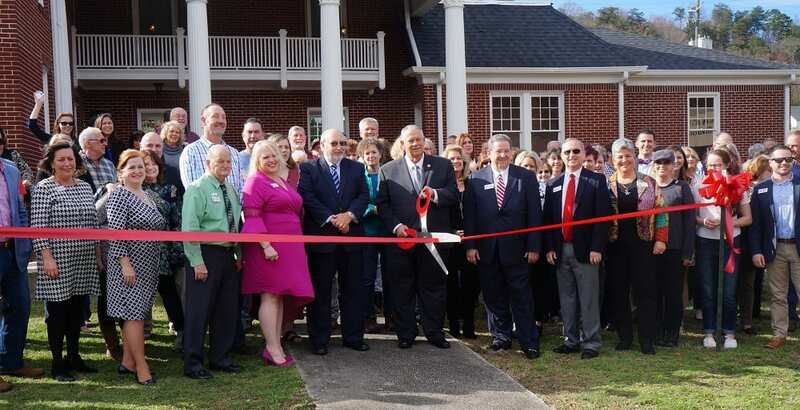 ELLIJAY, Ga. – Gilmer County is celebrating a five-year-long project completion today with the opening of the Downtown Welcome Center in Ellijay, Georgia. From left to right, Chamber President Paige Green and Commission Chairman Charlie Paris listen as Georgia Speaker of the House David Ralston speaks words of congratulations for Gilmer. A new branch for the Chamber and a “needed presence” downtown according to community leaders like Gilmer County Commission Chairman Charlie Paris and Gilmer Chamber President Paige Green, this new building will work across town from the Chamber home office and welcome center on Craig Street, just off of Highway 515 between the Waffle House and Advance Auto Parts. Today’s celebration marks the completion of the preparations and renovations, according to Green, who said the day also serves as the beginning of the Chamber’s return to downtown. A “homecoming” of sorts as the Chamber has been in the Watkins House before, located on the downtown square next to the courthouse. Green said it wasn’t only the Chamber’s efforts, but a collective involving the Chamber, the Board of Commissioners, and State Legislative involvement from Georgia Speaker of the House of Representatives David Ralston. This alliance’s dedication has pushed the project across the year’s to come to today’s fruition. While that dedication has stretched five years since conversations first began about the Chamber re-opening the Watkins House as a Welcome Center, Green noted that the Board of Directors’ recent Chairman Trent Sanford and current Chairman John Marshall have made the major push through these last two years to begin and finish the actual renovations on the building. Back left to right, John Marshall, David Ralston, and Trent Sanford. Front left to right, Dallas Miller, Karla Roper, Charlie Paris, Karleen Ferguson, and Paige Green. Green went on to say that the Downtown Center will also be opened for meeting space needs, or for those visitors who simply need a place to sit and rest. She wants the Downtown Welcome Center to be open in this sense for both tourists and locals. 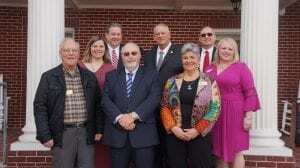 The celebration also saw visits from each of the Gilmer County Commissioners, Chairman Charlie Paris and Post Commissioners Dallas Miller and Karleen Ferguson, as well as Speaker Ralston. Paris offered his thanks to Ralston as well saying that without his help, the community might still be waiting for a downtown center. Paris spoke about the many “dominoes” that needed to fall in order to accomplish what they have. From relocating the Planning and Zoning Office on the other side of the square to needing help from the Department of Transportation and Ralston for logistics. Paris praised the Chamber and community volunteers and merchants who were integral in making the Welcome Center look as amazing as it does now. 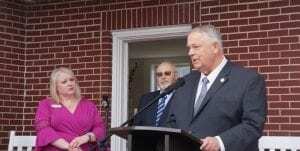 Ralston also offered a few words as he congratulated the county on the facility. He spoke about the history of the Watkins House and its journey through generations and his personal memories of hanging out at the courthouse and walking past the Watkins House everyday after school. 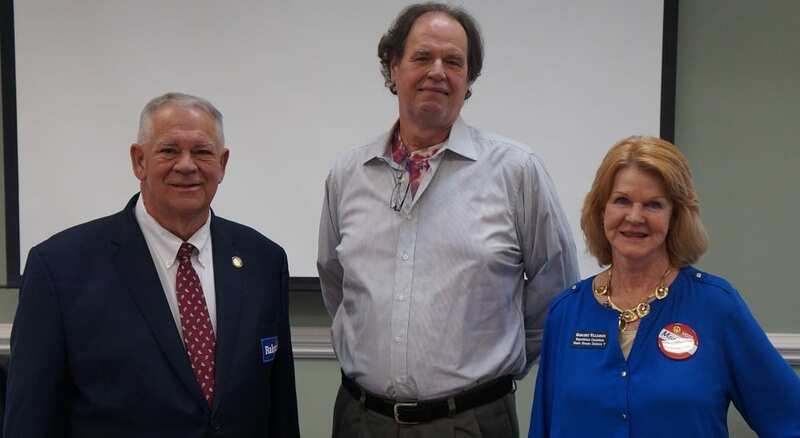 Ralston went on to note the significance of the statement the Chamber is making to the citizens of Ellijay and the investment they are making in the community. Brenda Davis, former Director of the Gilmer Chamber of Commerce, poses with her picture from the early 90’s in front of the Welcome Center. 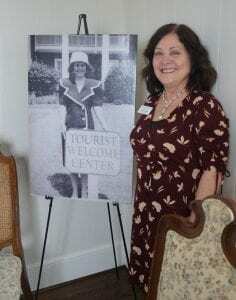 However, the day held more meaning than most understood, as they sipped wine from local vineyards and snacked of food from local restaurants, one family shared a moment around a special picture as former Chamber Director Brenda Davis, the lady in the picture, returned to her former offices and joined the celebrations of the changes and growth the building has seen since her last days in it. The photo, taken in the early 90’s according to Davis. She said it feels good to be back in the building as she pointed out the meetings she held in the large front room and secretary’s office in the room with her photo. She recalled how here entire family got recruited to “volunteer” for events and needs when she held the office and the Welcome Center was there. She chuckled as she pointed out she had an intern, at the time, named Sandy Ott. 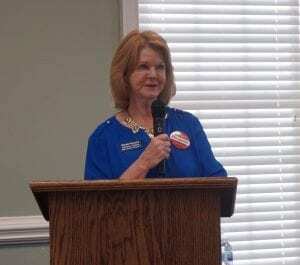 Now working for University of North Georgia and its expansion campus, Davis recalls her working for the Gilmer Chamber stuffing fliers and mailers for the Chamber. Davis also recalled a special memory at the Watkins House as they prepared for the Olympics in Atlanta. Davis said it was two years prior and Gilmer was hosting visitors from all over the world. They had received one foreign visitor whose interpreter was not available. He sat on the square as C Lloyd Smith began speaking with him and trying to make him happy with his visit despite the lack of a translator. Davis recalls Smith trying so hard to make this visitor feel welcome despite the major hurdle of language. Memories like this are built into the bricks of the Watkins House. It seems anyone who lived or worked in Ellijay at the time has some memory tied to the building. As the Chamber returns to its former home, employees, citizens, and even those who no longer live in the county, will return with them to revisit old times, old memories, and tie them together with a new gateway in our community and new visitors creating new memories. 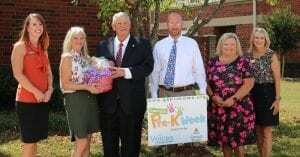 ELLIJAY, Ga. – Mountain View Elementary (MVE) school hosted the Georgia Speaker of the House, Rep. David Ralston, on Thursday, October 4, as part of the Georgia Pre-k Week program. Originally launched in 1992, Georgia Pre-K is a lottery-funded program serving four-year-olds in the state regardless of parental income. After almost losing the program to cuts in 2010, the Pre-K Week celebration was created to emphasize the importance of quality early childhood education by providing opportunities for leaders to engage with pre-k classrooms in their local communities. Ralston’s visit came to MVE in its second year of the return to pre-school classes at their location. Visiting both pre-k classrooms, he read Behind the Little Red Door in Katlin Johnston’s class and Pete the Cat and His Four Groovy Buttons in Gina Brock’s class. 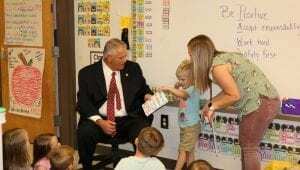 Having previously visited Ellijay Primary school year’s ago, his return to the new location is made possibly by Gilmer County’s L4GA Grant providing supplemental literacy funds to the education system. A part of the grant, the “Birth-to-5 piece,” is the major part of increasing literacy and putting books into the hands of kids at home. By extensions, educators hope to build the language skills and development for not only those children, but also to other younger children in the household as well. 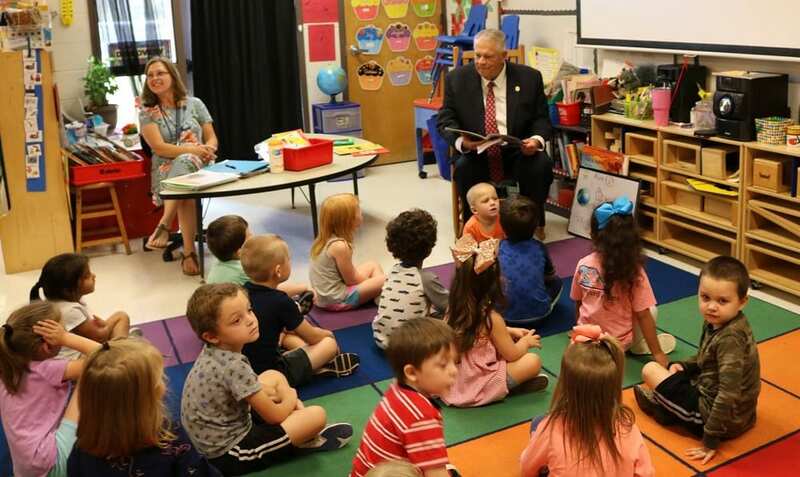 Gilmer’s Pre-K Director Katrina Kingsley told FYN this is usually an annual event to host lawmaker’s in our schools and allow them firsthand knowledge of what’s going on in these classrooms. Kingsley asserted the importance of programs like this as it not only educates lawmakers on our schools, but the grant and program allow pre-k teachers to affect even more students. Just as the body needs food and nourishment, Kingsley said these kids need “nourishment for the brain. Check out more photos of the event at FYN’s Facebook Page. « Previous Article “Conservative” Republican Congressman Tom Graves refuses to support English as the official language of the United States. 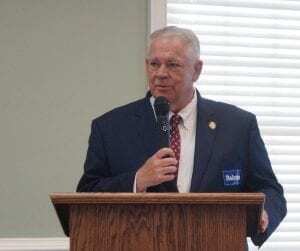 Blue Ridge, Ga. – Many words were used to describe Rick Day as he exited the Fannin County Democratic meeting on July 2: enthusiastic, informed, entertaining, and passionate. 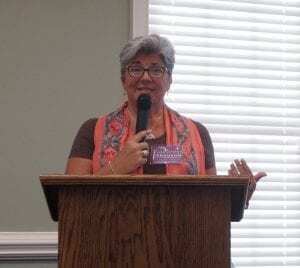 Day, a 62 year old veteran, is the first from the Democratic party to ever challenge the Speaker of the House, David Ralston, for the seat of Georgia House of Representatives District 7. 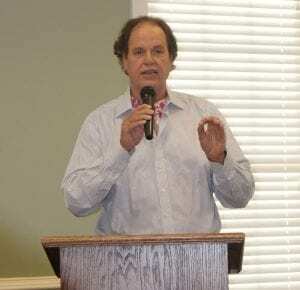 One key issue of Day’s platform and arguably one that he shows the most passion for is his pro-cannabis stance and the benefits it could bring to North Georgia. “Somewhere in the 70’s I discovered cannabis, marijuana, and it has been a lifelong love affair with Mary Jane,” Day said about his position. 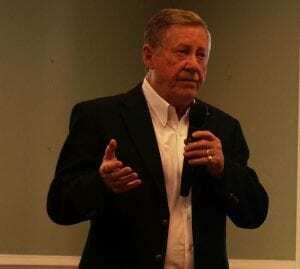 Democratic candidate Rick Day hopes to unseat incumbent David Ralston in November. 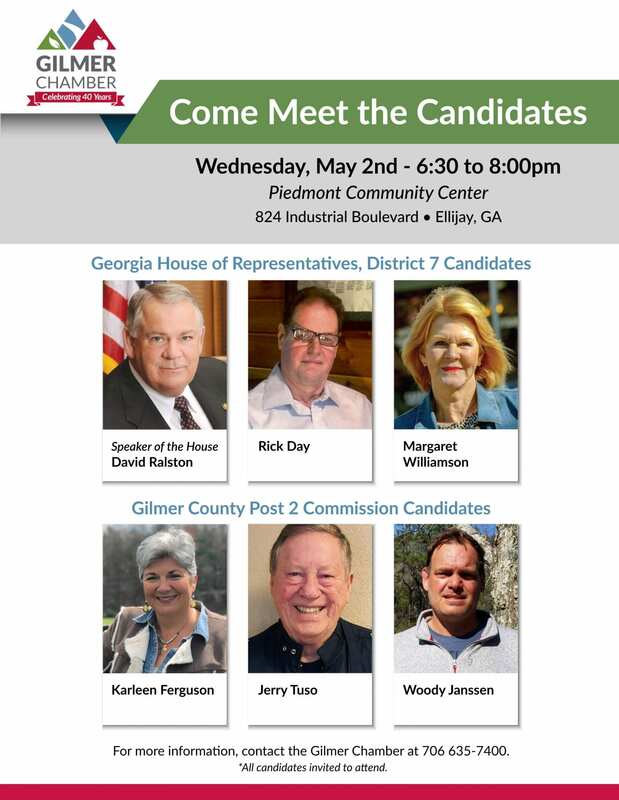 According to Day, almost 700,000 people have been arrested for minor marijuana possession in Georgia since Ralston’s election to the seat of District 7 in 2002. Day would like to see Georgia move beyond the limited laws passed recently in the state that increased medical marijuana use and see cannabis legalized for recreational use as well. Stating statistics, Day said that approximately 85 percent of Georgians are in favor of medical marijuana, 70 percent of Republicans are in favor, and 65 percent of Georgians favor cannabis oil. “If we wait another 10 years, the crops are not going to be worth anything near what it was because it’s going to be so common,” Day spoke of the economic impact of ending the war on marijuana. Wanting to see both marijuana and hemp become major cash crops for the state of Georgia, Day spoke of the increased tax revenue that this legislation, if passed, would create; up to 1 billion in increased revenue. Day would like to see all citizens of North Georgia benefit from this wealth by using the new revenue to eliminate or dramatically decrease property taxes. “My vision is to turn this (North Georgia) into the Napa Valley of cannabis,” Day enthusiastically spoke of his hope. With no shortage of half million dollar homes, Day says that it is very hard to find homes in the $150,000 range where there is an increasingly growing demand. Offering grants and incentives for builders to construct these more affordable homes is a possible solution that Day sees on this issue. Day says that his political platform is simple. Having been shown a kindness when he was a young man, his philosophy is to pay it forward. His litmus test on every issue is “Is this going to be good for our kids? Is this going to be good for our grand-kids?”. “I oppose the things that are not, and I embrace the things that are good,” Day said of this philosophy. Our 2nd Amendment rights are not up for debate. That’s why I refuse to entertain gun control activists who seek to undermine our safety and compromise the freedoms guaranteed by the U.S. Constitution. 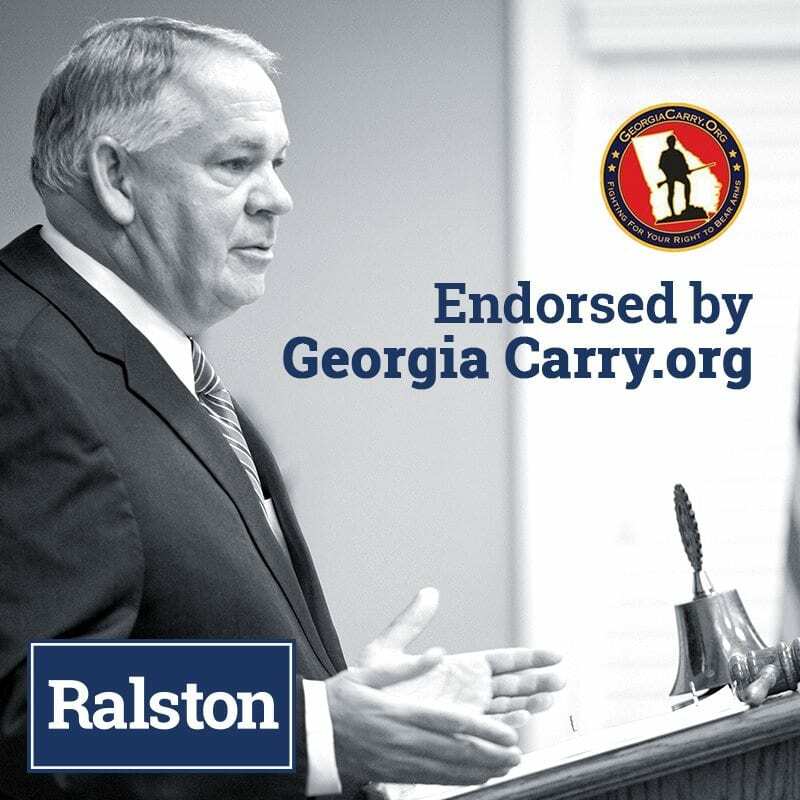 From passing “the most pro-gun bill in state history” to ensuring that students, faculty, and visitors can protect themselves on a college campus, I am proud of my record of defending and expanding our 2nd Amendment Rights. 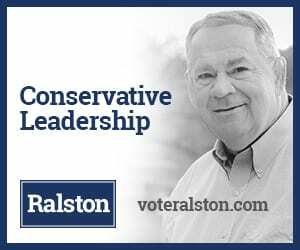 Next Article » Should Ralston be Re-Elected? 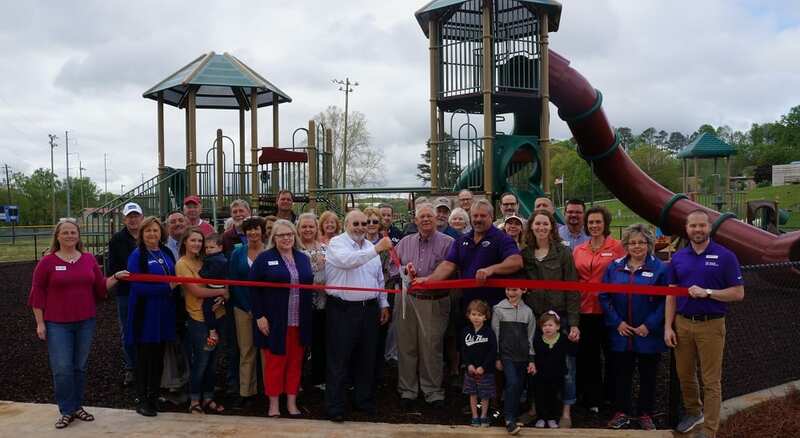 ELLIJAY, Ga. – Officials from both the county and state met today in Gilmer’s River Park to join with the Gilmer Chamber in officially cutting the ribbon on the new playground at River Park. Gilmer County Commission Chairman Charlie Paris and Post 2 Commissioner Travis Crouch met with Georgia Speaker of the House David Ralston for the event celebrating the work of all parties. 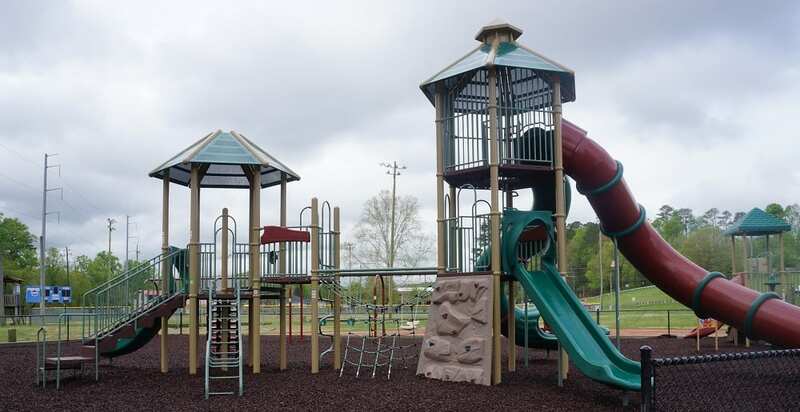 “The grant from the state really made it all possible,” said Crouch who added that seeing the county with successes like the new playground gives him a sense of accomplishment after the hard work the Board of Commissioners has put into directing the county over the last four years. 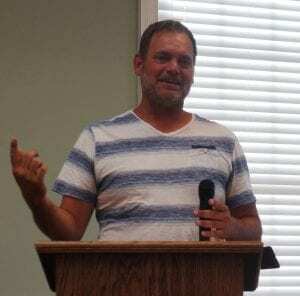 Paris took note at the ceremony to thank Kevan White, Gilmer County Recreation and Parks Department Director, for his vision and direction in the project. 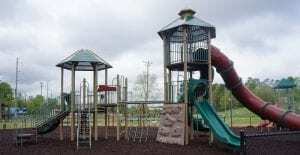 Despite the project taking a little longer than originally expected due to weather and unexpected costs, Paris said the park looked “more spectacular than I thought it was going to be.” Paris told FYN the entire playground was White’s vision as he took the main brunt of design and layout for something he could not have imagined. The completed playground equipment at River Park is officially opened after today’s Ribbon Cutting Ceremony. 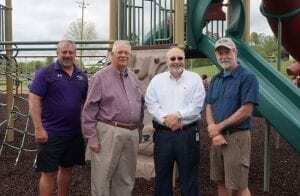 During the ceremony, Speaker Ralston took a moment to say he was proud to have played a small part in the project of the new playground but thanked Chairman Paris and the County for their hard work in making the project a reality, specifically noting White’s leadership role. 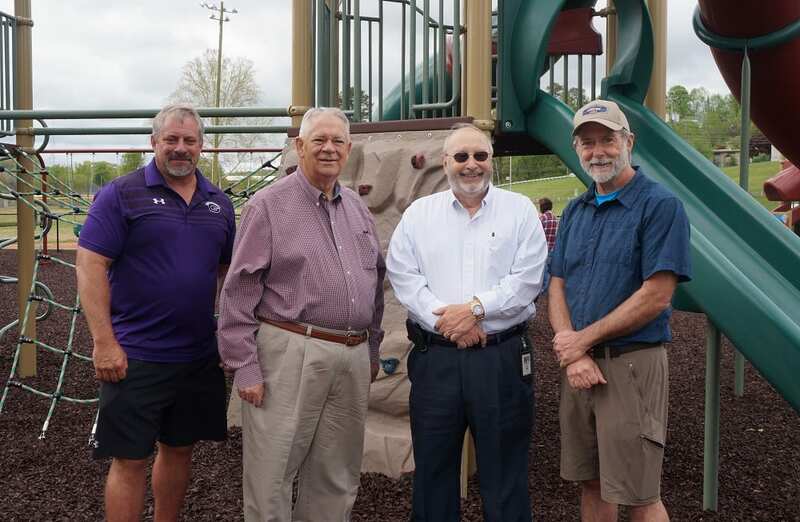 Left to right, Kevan White, David Ralston, Charlie Paris, and Travis Crouch take a moment to pose in front of the county’s new playground. Paris echoed his sentiments thanking the public for their support and patience in the time up to now as well as in the coming months when the county moves forward on the other projects planned for River Park. 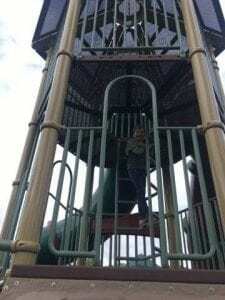 See more details on what’s coming next for the park with FYN’s recent article, “County’s River Park moving closer to upgrades” or check out more photos of the playground as well as a few members of the county enjoying the new equipment on FYN’s Facebook Page. BLUE RIDGE, Ga. – In a recent interview on FYNTV, Georgia Speaker of the House David Ralston made an announcement regarding the University of North Georgia’s (UNG) Blue Ridge campus. Ralston confirmed in the interview that the state has set $5.5 million into a line item to establish a new standalone “brick and mortar” building for the university. The budgeted funds are set for construction only, meaning that the university will be responsible for locating and acquiring a spot suitable for the new campus. Once the college purchases the location, they can utilize the state funds for their new building to expand into that new home in Fannin County. Ott noted some of the major capabilities that a standalone campus will allow including expanded course offerings, lab spaces for sciences and core classes, as well as development space to cater to the region’s specific needs. While college officials are still searching for the best location at this time, Ott confirmed that they are still very early in the process and uncertain if the new standalone campus will see them completely leaving their current location just off of 515 at 83 Dunbarton Farm Road. UNG has been at that location since 2015, offering opportunities such as dual-enrollment courses for high school students, a full-time program for first-time freshmen, courses for adult learners getting started or returning to college, and continued education programs. With the passing of the state’s budget, this is now set for UNG to utilize when available. Ott assures FYN they are moving quickly to take advantage of the funds to increase their services as soon as possible for students. See more by checking out the announcement at 14 minutes into FYNTV’s video below.